The first time you start the Play Music app on your Samsung Galaxy tablet, you may be asked whether you’d like to try Google Play Music All Access. It’s an all-the-time music service from Google, available for a monthly fee. You do not have to subscribe to the service to use the Play Music app on your tablet. The music stored on your tablet is presented in the Play Music app by category. Each category appears as a tab atop the screen. Change categories by swiping the screen left or right, or touch a category tab directly. The categories are merely ways the music is organized — ways to make the music easier to find when you may know, say, an artist’s name but not an album title. The Genres category is for those times when you’re in the mood for a certain type of music but don’t know, or don’t mind, who recorded it. Music is stored on the tablet’s internal memory but is available also from your Google Play account on the Internet. Use the Library menu to choose which music to view: The All Music item shows all music available to you, on the tablet as well as on the Internet. The On Device item shows only the music stored directly on the tablet. The size of internal memory limits the amount of music that can be stored on your tablet. Also, consider that storing pictures and videos horns in on some of the space that can be used to store music. Two types of album artwork are used by the Play Music app. For purchased music, the album artwork represents the original album. That may also happen for music copied (imported) from your computer. Otherwise, the Play Music app slaps down a generic album cover. When the tablet can’t recognize an artist, it uses the title Unknown Artist. This usually happens with music you copy manually to your tablet, but it can apply also to audio recordings you make. Most of the music you have in your Google Play Music library, especially music obtained from the Play Store, is stored on the Internet, not on the tablet. As long as you have an Internet connection, your tablet can play the music, but when you don’t have an Internet connection . . . silence. Display the sidebar in the Play Music app, and then choose my Library. 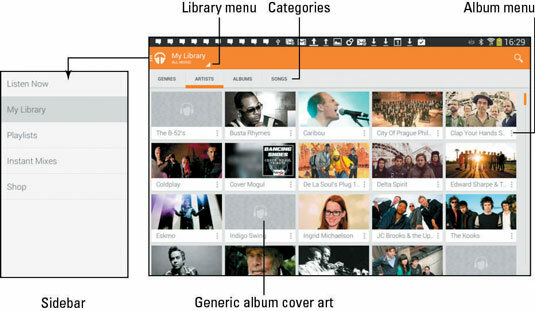 Locate the song, artist, or album you want to keep stored on the tablet. Touch the Menu icon by the song, artist, or album. Touch that icon to see a pop-up menu. Choose the Keep on Device command. The music is downloaded to the tablet, keeping it on the device. It’s available to play all the time. Music that’s been kept on the tablet features a Pin icon. That icon can be used also when viewing an album; when you see it, touch the icon to keep the entire album on the device. When you copy music to the tablet from a computer the music is always kept on the tablet. To review the music already on the tablet, go to the main Play Music app screen. Touch the Library menu and choose the On Device command.